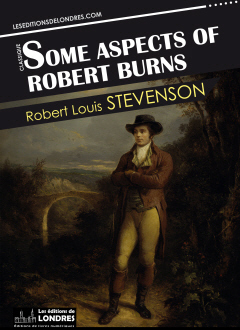 “Some aspects of Robert Burns” is a short essay from the compilation “Familiar studies of men and books”, by Robert Louis Stevenson. “Some aspects of Robert Burns” was first published in Cornhill magazine in August 1879. Burns.—I have left the introductory sentences on Principal Shairp, partly to explain my own paper, which was merely supplemental to his amiable but imperfect book, partly because that book appears to me truly misleading both as to the character and the genius of Burns. This seems ungracious, but Mr. Shairp has himself to blame; so good a Wordsworthian was out of character upon that stage. This half apology apart, nothing more falls to be said except upon a remark called forth by my study in the columns of a literary Review. The exact terms in which that sheet disposed of Burns I cannot now recall; but they were to this effect—that Burns was a bad man, the impure vehicle of fine verses; and that this was the view to which all criticism tended. Now I knew, for my own part, that it was with the profoundest pity, but with a growing esteem, that I studied the man's desperate efforts to do right; and the more I reflected, the stranger it appeared to me that any thinking being should feel otherwise. The complete letters shed, indeed, a light on the depths to which Burns had sunk in his character of Don Juan, but they enhance in the same proportion the hopeless nobility of his marrying Jean. That I ought to have stated this more noisily I now see; but that any one should fail to see it for himself, is to me a thing both incomprehensible and worthy of open scorn. If Burns, on the facts dealt with in this study, is to be called a bad man, I question very much whether either I or the writer in the Review have ever encountered what it would be fair to call a good one. All have some fault. The fault of each grinds down the hearts of those about him, and—let us not blink the truth—hurries both him and them into the grave. And when we find a man persevering indeed, in his fault, as all of us do, and openly overtaken, as not all of us are, by its consequences, to gloss the matter over, with too polite biographers, is to do the work of the wrecker disfiguring beacons on a perilous seaboard; but to call him bad, with a self-righteous chuckle, is to be talking in one's sleep with Heedless and Too-bold in the arbour. Yet it is undeniable that much anger and distress is raised in many quarters by the least attempt to state plainly, what every one well knows, of Burns's profligacy, and of the fatal consequences of his marriage. And for this there are perhaps two subsidiary reasons. For, first, there is, in our drunken land, a certain privilege extended to drunkenness. In Scotland, in particular, it is almost respectable, above all when compared with any “irregularity between the sexes.” The selfishness of the one, so much more gross in essence, is so much less immediately conspicuous in its results that our demiurgeous Mrs. Grundy smiles apologetically on its victims. It is often said—I have heard it with these ears—that drunkenness “may lead to vice.” Now I did not think it at all proved that Burns was what is called a drunkard; and I was obliged to dwell very plainly on the irregularity and the too frequent vanity and meanness of his relations to women. Hence, in the eyes of many, my study was a step towards the demonstration of Burns's radical badness. But second, there is a certain class, professors of that low morality so greatly more distressing than the better sort of vice, to whom you must never represent an act that was virtuous in itself, as attended by any other consequences than a large family and fortune. To hint that Burns's marriage had an evil influence is, with this class, to deny the moral law. Yet such is the fact. It was bravely done; but he had presumed too far on his strength. One after another the lights of his life went out, and he fell from circle to circle to the dishonoured sickbed of the end. And surely for any one that has a thing to call a soul he shines out tenfold more nobly in the failure of that frantic effort to do right, than if he had turned on his heel with Worldly Wiseman, married a congenial spouse, and lived orderly and died reputably an old man. It is his chief title that he refrained from “the wrong that amendeth wrong.” But the common, trashy mind of our generation is still aghast, like the Jews of old, at any word of an unsuccessful virtue. Job has been written and read; the tower of Siloam fell nineteen hundred years ago; yet we have still to desire a little Christianity, or, failing that, a little even of that rude, old, Norse nobility of soul, which saw virtue and vice alike go unrewarded, and was yet not shaken in its faith.